Did you know that it is a year this week since work started in the Church to repair the bell frame? Over the last year (2014) you have probably heard us practising on Friday evenings and ringing for some of the services in the Church. We usually ring ‘rounds’, which is ringing the bells in sequence from the lightest (the treble) to the heaviest (the tenor), or simple ‘call changes’ where the ringing order of two of the bells is swapped round. Sometimes (with help) we might ring more complex ‘methods’ where the order of the bells changes each time in a specific pattern. To celebrate the first anniversary of the restoration work being completed, on Saturday 7th Feb, Graham Nabb and friends will attempt to ring the the first ever full peal on the Horley bells. (Graham was instrumental in getting our bells working again and has taught most of us to ring, so it is very appropriate that he rings the first peal.) A peal is when more than 5000 ‘changes’ are rung continuously and takes about 2 hours & 45 minutes. On Horley’s six bells it is only possible to ring 720 different changes, so to achieve the necessary number of changes for a peal, the 720 changes will be rung seven times, each time in a different way. Ringing a peal is a skilled task requiring much practice and is the highest level of performance in bell ringing (we locals are not at that standard yet!) Great concentration is needed as well as the ability to ring very accurately to maintain a good rhythm. No rests or breaks are allowed as it is one continuous performance. A full peal has never been rung in Horley before, so listen out and/or come and watch the bells being rung by experts on Saturday 7th Feb from about 9.30am onwards. 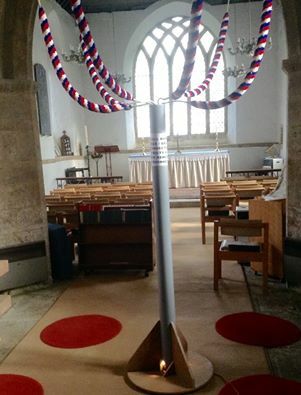 PS If anyone is interested in learning to ring, please get in touch (email: alison.tite@gmail.com) – we would love to have more people in the village who can ring. Remembrance Sunday 8th November a full peal will be rung between 1400 and 1700. The band are experts so it should be high quality ringing. What’s a peal? A peal is when more than 5000 ‘changes’ are rung continuously and usually lasts about two and three quarter hours. A ‘change’ is when the order of the bells is changed, so for example instead of ringing bells 1-2-3-4-5-6 in turn (called rounds), the order might become 2-1-3–4-5-6. This is one ‘change’). On six bells as we have in Horley, 720 different changes are possible, so to achieve the necessary number of changes for a peal, the 720 changes will be rung seven times, each time in a different way. As you can imagine, this requires great concentration and skill as there are no rests, breaks or swapping over ringers during the peal.